Home / Latest News / Adoption of Dagobert…. 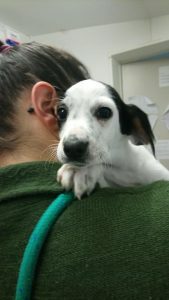 I am sure that our followers will be just as relieved as me that puppy Dagobert has been adopted. We bombarded every social media site possible appealing for a family for him. We certainly were not going to let this little pup grown up in the refuge! Dagobert, that last of the Famous Five litter to be adopted! Pups that grow up in the refuge are at a big disadvantage to those in a family. Careful socialisation is everything and without it we are relying on adopters to play catch up when they adopt. Sometimes this is very easy but often its not and that is why we do everything within our powers to ensure that doesn’t happen. Remember socialisation is not just playing with other dogs, its getting out and about in town, getting used to busy public areas, meeting other animals such as cats, chickens, horses or sheep. Many dogs who have been undersocialized are terrified walking through the town with all the traffic and strange noises. If you want a dog that you can take everywhere you need to put the work in and socialize them to these situations. With my first pup I had him walking around town, in every restaurant and shopping centre that allowed us, at the airport, on a train and bus….the list is endless, but thats what you need to do. I did make one big mistake in that I forgot to teach him to be home alone. Big mistake! Luckily the addition of another dog helped him through this but you learn on your feet with your first pup and I was very lucky not to have ended up with a dog with separation anxiety! With spring in the air this is a great time to get a pup and get it out and about. Keep an eye on our facebook page for the next litter……I am sure that it will be very soon. Next: Adoption of Stewey and Hagrid is back home.